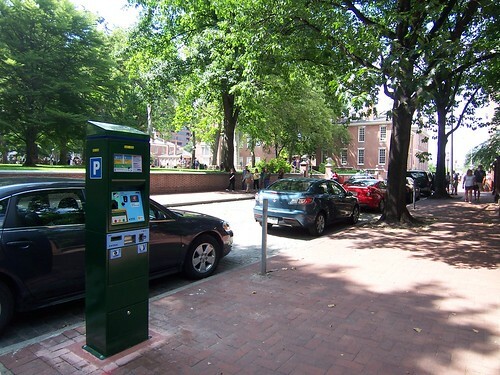 In July, the Philadelphia Parking Authority will install multi-space meters throughout Center City that will offer patrons numerous payment options and aim to free up more parking spaces. Two or three computerized meters will be installed on each block in the “core” of Center City — from Fourth to 20th streets and Arch to Locust — where patrons can pay for the amount of time they need and then receive a printed ticket to display on their dashboards. The new meters will accept coins, dollar bills, credit cards and PPA Smart Cards. The $11-million project will be completed in this area of Center City by the end of July and will be implemented next in University City and the rest of Center City by February. BCGP, City Officials, the Center City District and the Parking Authority are scrambling to come up with a solution, with hard to find funding being crucial for the conversion of parking meters to the Toronto Style "post and ring bike racks". But it seems inevitable that the speed of the parking meter changeover will at least result in a short term crisis on blocks without sufficient bike racks. Some blocks like the 600 block of Walnut St are already devoid of bike parking spaces with a row of headless meters. Let the BCGP and the City know if the parking meter conversion is affecting your ability to park your bike. 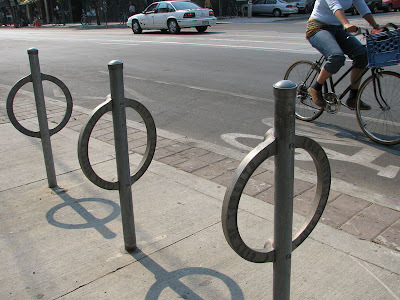 This will help prioritize where bike parking is needed most. Toronto Post and Ring Racks converted from meter poles. I saw this on the 100 S block of 34th street for a while before they re-landscaped the area in front of EMS, can't they just remove the actual metering devices heads and leave the cross bar that the meter heads screw into for the double meters. This cross bar is wide enough that a U-lock cannot slip over it and it creates a bike rack while only requiring to unscrew the meter heads. I like the idea of simply leaving the cross bar on, which doesn't cost any money to do. The stubs for the old parking meters will eventually be removed from the ground.